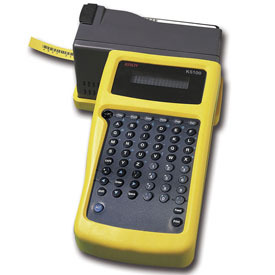 Kroy K5100 Label Printer -The Kroy K5100 Handheld Label and Wire-Marking Printer. This printer surpassess the K2500, with such features as print resolution of 300 dpi, auto sizing, increased print speeds, internal battery charger, downloadable fonts and increased on-board memory. Additionally, the K5100 uses the easy to load Kroy Cartridge System allowing you to change your media in seconds. Compatible with most software so that printing labels from programs like Microsoft® Word and Excel are a snap. Print graphics, logos, bar codes, and data records. Use as stand alone or connected to PC. Comes with Kroy Label Designer Software(KLDS) and drivers. Uses continuous and die cut media. Built in cutter and feed control. Real time clock with time/date stamping ability. Includes: K5100 Printer, Owner's Manual, AC Adapter, CD ROM Software and Serial Cable.